Do you believe in miracles? This prayer to Our Lady of Lourdes printed below commemorates a beautiful one! 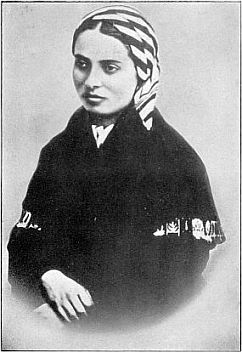 In 1858 the Blessed Virgin Mary appeared to Bernadette Soubirous (both pictured above), a humble 14-year-old French girl in a grotto near the town of Lourdes in France asking for, among other things, prayer and penance for sinners. O ever immaculate Virgin, Mother of mercy, health of the sick, refuge of sinners, comfort of the afflicted, you know my wants, my troubles, my sufferings; deign to cast upon me a look of mercy. By appearing in the Grotto of Lourdes, you were pleased to make it a privileged sanctuary, whence you dispense your favors, and already many sufferers have obtained the cure of their infirmities, both spiritual and corporal. I come, therefore, with the most unbounded confidence, to implore your maternal intercession. Obtain, O loving Mother, the grant of my requests. 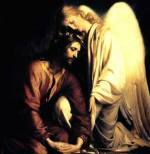 I will endeavor to imitate your virtues, that I may one day share your glory, and bless you in eternity. Amen. During the ninth of her 18 different appearances to Bernadette that year, our Lady of Lourdes, as Mary became known in association with these events, had the girl dig up a spring of water where none had been found before. The water flowing from this spring, although pure, did not have any extraordinary scientific or medical properties. It has nonetheless been the source of countless miraculous cures for 150 years! This was indeed astounding, almost as much so as the cures for various ailments that started taking place when people washed themselves with the spring water from the grotto. The Dogma of the Immaculate Conception, that the Blessed Virgin Mary was born without Original Sin, had been officially established by Pope Pius IX in 1854. However, Bernadette had no knowledge of this when she ran all the way to the rectory to see Fr. Peyramale, repeating the name Our Lady gave her over and over so she wouldn’t forget it! This was just one of the miracles associated with Our Lady of Lourdes. The stream of water soon produced a steady stream of visitors seeking aid for their afflictions. 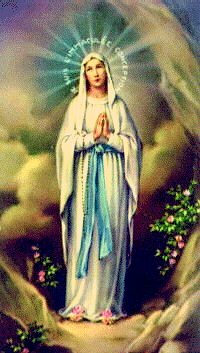 The Church investigated the apparitions of Our Lady of Lourdes thoroughly and Bishop Laurence of the diocese of Tarbes-et-Lourdes declared them to be authentic in 1862. All in all, about four to six million pilgrims visit these churches annually! Although many of those who go to the Shrine at Lourdes, more fully described in this website are not cured of their illnesses, enough have been healed over the years that it is estimated that some 200 million people have visited there since 1860! Lourdes is also a celebrated place of prayer, and both Rosary and Blessed Sacrament processions occur there daily. 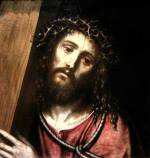 Speaking of the Blessed Sacrament processions, one well known Catholic convert, the author Msgr. Robert Hugh Benson, wrote in 1914 after having visited Lourdes and witnessed a healing during one of them that “the first overwhelming impression that remained with me is this—that I had been present, in my own body, in the twentieth century, and seen Jesus pass along by the sick folk, as He passed two thousand years before.” It strengthened his faith in Christ’s ability to perform healing miracles not just in the Gospels centuries earlier, but in his own time as well! Msgr. Benson also marveled that God “has chosen this place to show His power; and therefore has sent His Mother there, that we may look through her to Him.” Although we are not required as Catholics to believe in the apparitions or miracles of Lourdes, they certainly can strengthen our faith in our Lord and His Blessed Mother as much as they did his! Many of those malades (the French word for the sick) who go to Lourdes and are not healed leave there stronger spiritually, if not physically, nonetheless. 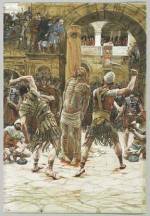 They know that their various ailments still have a redemptive character, much like our Lord’s did at Calvary in His Passion and, as long as they do not lose faith in Him, their sufferings will not be in vain! Bernadette herself entered the convent of the Sisters of Notre Dame in Nevers in 1866, serving our Lord with dignity, grace, and love in what was left of her short life. She passed away from tuberculosis in 1879 and was canonized as a saint in 1933. To this day her body remains incorruptible (that is to say, it shows no signs of decomposition or decay), another sign of the miracles associated with her. St. Bernadette once said of the spring she discovered that “one must have faith and pray; the water will have no virtue without faith.” Let us all be inspired by this prayer to Our Lady of Lourdes approach her with faith, hope and love!